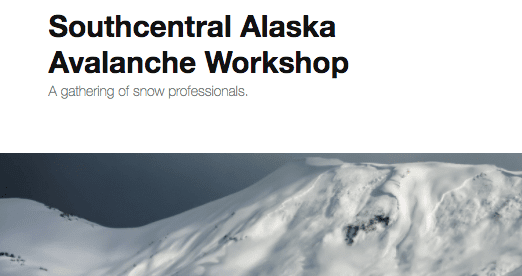 The Chugach National Forest Avalanche Center, Alaska Pacific University, Alaska Avalanche Information Center and the American Avalanche Association will be hosting a gathering of snow professionals for a day of learning, presentation, discussion, and networking. 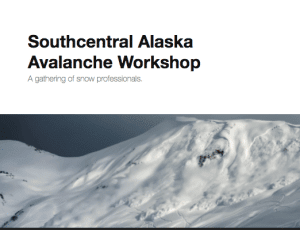 The 2016 Southcentral Alaska Avalanche Workshop (SAAW) will be held Friday, November 4th at Alaska Pacific University from 9am to 4:30pm, doors will open at 8:30. NEW THIS YEAR: Afternoon session (1-4:30pm) is FREE and geared to backcountry users as well as professionals!! Location: APU’s Atwood Building, 2nd Floor. Guest speakers this year include Drew Hardesty, from the Utah Avalanche Center, and Gabe Wolken, from the University of Alaska Fairbanks. Please see the Schedule for a list of presentations and speakers!! This will be the 4th annual SAAW and like the past workshops, we are looking forward to a great day of learning, networking and fun. Thank you to everyone who has made our first three events a huge success!! Please visit the Southcentral Alaska Avalanche Workshop website to learn more.